Do you ever sit in your seat before a performance and wonder what’s going on behind the curtain? That’s the great mystery of theater! It’s all an illusion intended to create a particular experience for the audience. Like the performances themselves, there is much that happens at the Reif Center, that goes unseen, so many individuals who contribute to the success of our mission that are hiding in the wings. We’re starting a new tradition – Backstage at the Reif Center – to introduce you to some of those activities and people. Come back here every month for a new interview! 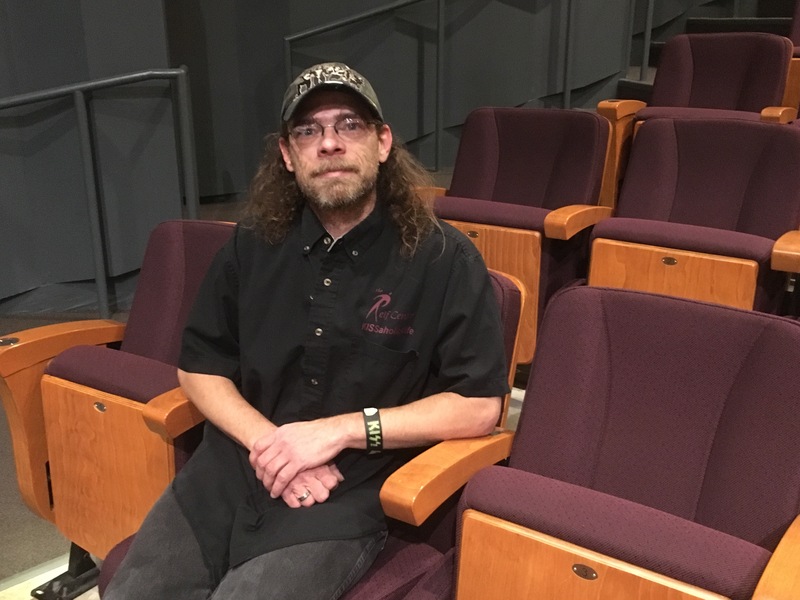 Our first interview is with Theater Technician, Greg Johnson. Greg can be found backstage at the Reif Center almost daily. You’d recognize him as the guy who’s always dressed in KISS garb. Katie: How were you introduced to the Reif Center? You’re not originally from Grand Rapids. season, so I came over and helped with the Party in the Park and set-up. For a few years, I would come for fun, three or four times a year. [John] gave me a list of all the shows and I’d come work for the performances I wanted to see. If there were more shows that week I’d stay and work them. It got to a point where I was working so much over here that I just moved. Katie: What were your responsibilities in working with The Pink Floyd Experience? Gre g: Basically load-in and load out. It was a huge show. I think there were 2 trailers with a lot of trussing. That’s when I first learned about “a pickle.” It’s a control for lifting chain motors. Our retractable seats [in the Ives Theater] use a pickle to move in and out. One of the truckers there had just been in Los Angeles a couple weeks before where he had talked to the guy that runs the KISS merchandise warehouse. I don’t know how it came about, but that trucker had a kid that was a KISS fan, so the guy let him into the warehouse and gave him a bunch of swag. When I was loading in I had my KISS shirt on, my typical thing, and he saw me. Towards the end of the show he brings out this hoodie and a KISS traveling mug and gave it to me. Afterwards, I went up to John and said “I don’t need to get paid for this gig, I got my payment right here.”I got to shake hands with someone who had walked on KISS hallowed ground. Katie: Did you get a paycheck though? Katie: What did you do before you worked at the Reif Center? Greg: Restaurant work, cooking and stuff. And I did a stint in the Navy. I wanted to do this back when I was growing up. I didn’t want to be a rock star – a Gene or a Paul. I wanted to be their manager. That’s where I thought the power was, the power and the fun. You get to do a lot of creating in that role. I don’t have the talent for the singing or the playing, but I have the other creative stuff. The Reif Center has let me use that over the years. I help set the design for the Talent Search. It used to be more plain and then we added a balloon drop one year and we do the confetti cannon now. The KISS It show, John let me design the whole thing. I ran the whole show too, even calling light cues during the show. Katie: Now that you’ve been with the Reif for a number of years, you do more than load in/out. Greg: Oh, yeah! For some shows I’m “the boss” backstage. I’ve run lights, sound, spotlights. We do security. I’ve actually performed in shows without people knowing that I’ve been on stage. Greg: The flying carpet [in Reif Dance’s production of Aladdin, June 2016]. Actually, in The Jungle Book, I was three of the four earthly elements. I was the river. I was wind – using the fog machine. And I was earth – I acted as a human stage weight for the throne. Instead of putting brakes on it, I said, “Well, I’ll just hold it,” because I had to haul it back off stage anyway. I performed as a backup singer for Kathy Mattea. There was one song she did, and it’s been a tradition for 20 some years or whatever, that all the backstage crew would come out. All we had to do was say one word at a particular time. We were on stage for 30 seconds. We came out as she was singing the line, shouted the word, and then marched back off stage. Katie: Do you remember the word? Greg: I don’t recall. I think it was something about a motorcycle or a beer or something like that. Katie: You also have “friends” that make frequent stage appearances. Greg: Oh, yes! For The Nutcracker, there’s usually a troll. The last few years there’s been a lobster, and I have a KISS-mas tree on stage. Katie: What is your favorite aspect about the Reif’s renovation? Greg: With the high roof we can do a lot more for the bigger shows that have drops. I know there were many shows before that we couldn’t use a lot of the drops or set pieces for because of the height. I’m also excited about the small black box theater. I’d like to see more local and regional artists, like the CenterStage MN series that just started – that last band [Davina & The Vagabonds] – they were awesome to work with! Or, the Insomniacs theater project the Grand Rapids Players did a while back was fun. Katie: What’s been your favorite performance that you’ve seen at the Reif Center? Greg: KISS It is obviously my favorite show, but there have been many others like Gypsy, The Blues Brothers Revue, One Night of Queen, Satisfaction, Peter Yarrow, and Peter Noone. Katie: What about your favorite group to work with? Greg: My favorite group to work with is Troupe America who does The Church Basement Ladies. We’ve gotten to work with them for longer periods of time and they’re so fun. There are others though: The Rock & Roll Xmas Show – those are some awesome people to work with. The Riders in the Sky are always awesome to work with. I’ve worked with them a few times. But there’s a lot of shows that come through that I get to hang out, or work with, the back stage crew or even the artist. Paula Poundstone – she is awesome. She loves to chit-chat. I had mentioned something about deer hunting right before she went out on stage and she brought it up in the first few minutes of her act. Same thing with Riders in the Sky. They count the number of shows they do, so I asked them “What number is this?” They said 6,000 something, almost 7,000. Well, I said, “KISS has done only 2,000 and they’ve been around a couple years longer than you.” (Riders came out in ’79, KISS came out in ’74, though I think Riders are a bit older age-wise.) After the Riders first song, they mentioned that they had not been around as long as KISS, but they had done more shows. Stuff like that is pretty cool. I don’t remember all of them, but there are a lot of tours that come through where we become “friends for the day” with the crew, or the band members, or even the artists themselves. I love hearing the road stories from the road crew. Katie: You and Paula Poundstone have a bit of a friendship don’t you? Greg: Yeah. It started out when she posted a picture of the mirrors in another theater’s Green Room and all the light bulbs surrounding them were burnt out or missing. We wanted to impress her, so we made sure all of our light bulbs were working. Then we set-up the Green Room with a bunch of cat stuff to make her feel at home. (She had like 16 cats at the time.) We’ve been collecting cat stuff ever since – I think we’ve got eight or nine totes worth. She sent a picture to John and I of one of her cats thanking us. I have that framed at home. She was really cool. Katie: So, we’ve talked about favorites, but what about a performer or group that stands out in your mind as being – we won’t say “the worst” – but eccentric to work with? Greg: The ones I feel sorry for are the tours where the artist is on the bus all day and the only time you see them in the building is when they walk from the bus to the stage and back to the bus. They miss out on our small town charm. We work hard to give every artist a good experience.